The Flag Consideration Panel has whittled 10,292 flag designs submitted down to a long-list of 40. If you click on the link you’ll see who submitted each one. I am open to change but am not keen on the black and white or black and grey ones second and third from the left in the third line and I don’t think the second from the left in the bottom line is a distinctively New Zealand image. My favourite is third down on the left, designed by Kyle Lockwood, supported, or variations of which were submitted, by 12 others.
. . . “We would like to thank everyone for their design suggestions and we’ve been impressed with the very high standard. The Panel made a unanimous decision and selected flag designs we believe best reflect New Zealand’s identity, as shared with us in the values and themes that New Zealanders expressed throughout this process. In reviewing alternatives, we were guided that a potential new flag should unmistakably be from New Zealand and celebrate us as a progressive, inclusive nation that is connected to its environment, and has a sense of its past and vision for its future. The Panel has made its preliminary selection of flag designs that it believes best represent the range of suggestions it has received. It is important that those designs are timeless, can work in a variety of contexts, are simple, uncluttered, balanced and have good contrast,” said Professor Burrows. . .
We want to thank everyone for the 10,292 designs you’ve suggested. Each of these was viewed by every Panel member. We have been impressed with the very high standard and greatly appreciate the thought and hard work that went into these designs. As a Panel, we have now selected a long list of designs for further investigation as part of the design review process. In reviewing flag designs, first and foremost, we were guided by what thousands of Kiwis across a range of communities told us when they shared what is special to them about New Zealand. This provided the Panel, and flag designers, with valuable direction as to how New Zealanders see our country and how those values might best be expressed in a new flag. The message was clear, and the Panel agreed. A potential new flag should unmistakably be from New Zealand and celebrate us as a progressive, inclusive nation that is connected to its environment, and has a sense of its past and a vision for its future. 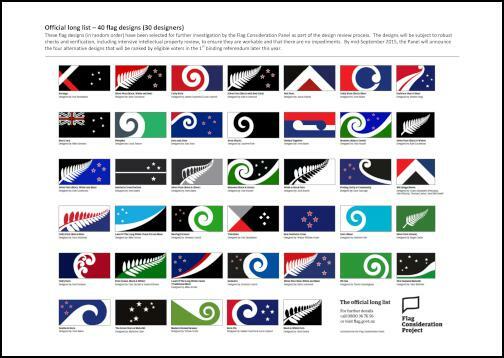 In finalising the long list we invited a number of cultural (including tikanga), vexillology (the study of flags), art and design experts to review the selection, to ensure the designs are workable and there are no known impediments. Detailed due diligence will now be completed on these designs, including robust intellectual property checks. By mid-September we will select the 4 alternatives which eligible voters will rank in the first binding referendum later this year. This will be the opportunity for people to express their preferences and make choices. We encourage you to make sure you are enrolled to vote so that you can take part in this nationally significant process. In March next year, New Zealand will make history when it votes between the current flag and the preferred alternative.